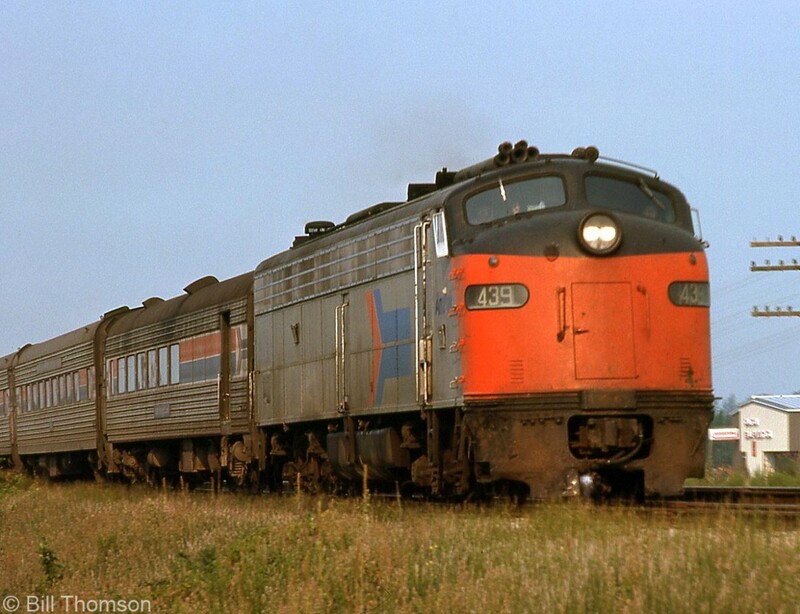 Railpictures.ca - Bill Thomson Photo: When Amtrak was formed to take over passenger services from railroads in America it acquired a varied fleet of secondhand passenger cars and locomotives, including an assortment of EMD E-units from a few different roads. Here, Amtrak E8A 439 (formerly Richmond, Fredericksburg and Potomac RR 1007, repainted in the early Amtrak livery) hurries the Niagara Rainbow through Tilbury, Ontario over the Conrail CASO Sub in August 1976. | Railpictures.ca – Canadian Railway Photography – photographie ferroviaire Canadienne. Caption: When Amtrak was formed to take over passenger services from railroads in America it acquired a varied fleet of secondhand passenger cars and locomotives, including an assortment of EMD E-units from a few different roads. Here, Amtrak E8A 439 (formerly Richmond, Fredericksburg and Potomac RR 1007, repainted in the early Amtrak livery) hurries the Niagara Rainbow through Tilbury, Ontario over the Conrail CASO Sub in August 1976.